Facing to the north, the FOO Club House is open for the night filled with the aromas of Dennis Farr's famous FOO chili dogs. With dusk setting in, amateurs prepare their telescopic instruments, for the night promises to be a glorious one. As I rose the morning of October 10, 2015, after giving thanks to our creator for allowing me to see another day, I moved my thoughts on completing the wooden telescope rings I was fabricating for my friend and colleague, Gary "Bambina" Barabino. In addition, I was thinking hard on whether or not I was going to drive up to Dennis Farr's FarrOut Observatory retreat in Dade City, FL for this months observing session (clubhouse photo above). Especially, since the weather forecast was showing a 30% chance of rain there, and we had a front coming through that produced a squall line of rain in my area! But as time went by, the wind direction began to change and clear out my area. That being the case, I figured if all was starting to look good here in Riverview, FL, it had to be great in Dade City, FL, to the north; and it did turn out that way! After getting myself together, I started loading the 2007 Mazda CX-7 with my equipment at around 16:20. 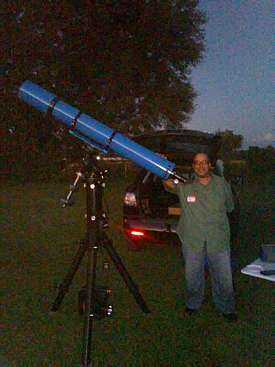 I had decided to bring the Jaegers 6" f/10 "Gelinda J. Dawson" refractor for its second exhibition under the stars; with this being its first trip to FOO. For its chariot, I brought along the Losmandy G-11 equatorial mount and Celestron PowerTank 17 to power it. They worked flawlessly together! Also, I took along my set of TeleVue Plossls, the Explore Scientific 9mm 100º, and Lunt 20mm 100º oculars. 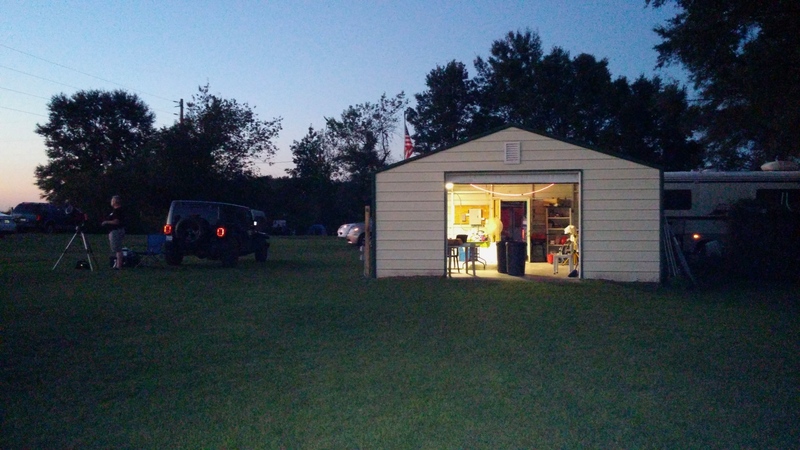 With everything loaded in the vehicle, I pulled out of my driveway at approximately 17:05 and had gotten onto I-75 when I realized that I had forgot to bring my star diagonal! I was distraught, but I decided to go back home and get it. That added another 30 minutes to my travel time, but I was happy that I planned to leave a bit early for just such a scenario. The trip there was fine, although there was a "higher than usual" amount of traffic on north bound I-75. I guess due to the Columbus Day holiday. Nevertheless, the trip up was great, as I could see that the sky conditions were quickly improving with well structured cumulus clouds gracing the extreme northern horizon, and the cool front settling in. My only concern now was the wind and upper air currents, which could play havoc on seeing conditions. I finally arrived a FOO at around 18:40. At the site was a group of folks already getting setup as the setting sun cast a golden glow over the site. After parking, I saw one gentlemen setting up his 10" Celestron, which was making me wish I had brought out the Meade LX200-R. But, I had my scope that I built in honor of the special one in my life, so I could not have done any better. I went over to the clubhouse building and saw Mr. Dennis Farr sitting at a small table at its entrance. It was great to see him again. What a fine gentlemen, friend and patron to the hobby he is. We greeted each other with a big hug and I commenced to pay my $5.00 admission fee. I was going to pay more, but Dennis (as usual) did not accept it. For the privilege to observing under skies like these, in such an awesome and welcoming environment, it is definitely worth so much more. Well, I continued a brief talk with Dennis to catch up a bit. We talked a bit on our (Gary and I) trip to Stellafane in 2014, and he told me that he now works and runs the MOSI (Museum of Science and Industry) planetarium and astronomical facilities there. He is definitely the right man for the job, and it is assuredly a pleasure and honor to be affiliated with him. After finishing up with Dennis, I went back to my car to unpack the scope when I heard a voice I had not heard in about a couple of years. It was Mark Jennings, who I last observed with a year or two prior at a previous FOO observing session. We had a great time then, and it was promising to be an awesome one again. Mark is much like Gary and me when it comes to observing. Much like Gary, he is a human finder. He can hit celestial objects quick, fast and in a hurry without the aid of a guide scope or finder. I look forward to when Gary comes down so they can meet. I know they are going to hit it off just fine. A shot of the MOSI Mars Astronomy Club as budding amateur astronomers are prepped with information for tonight's observing session. In the foreground, Tish and Mark Jennings await darks skies as the business end of the Jaegers 6" f/10 "Gelinda J. Dawson" refractor is seen in the photo to the right. Well moving on, Mark invited me to come over, so I moved my operations over to the east side of the site next to his. I got the privilege of also meeting Mark's wifeWell moving on, Mark invited me to come over, so I moved my operations over to the east side of the site next to his. I got the privilege of also meeting Mark's wife Tish, who is also an avid observer! Along with Mark and Tish, there was a couple of other regulars, like Butch, Brian and Mark's friend, Wayne. 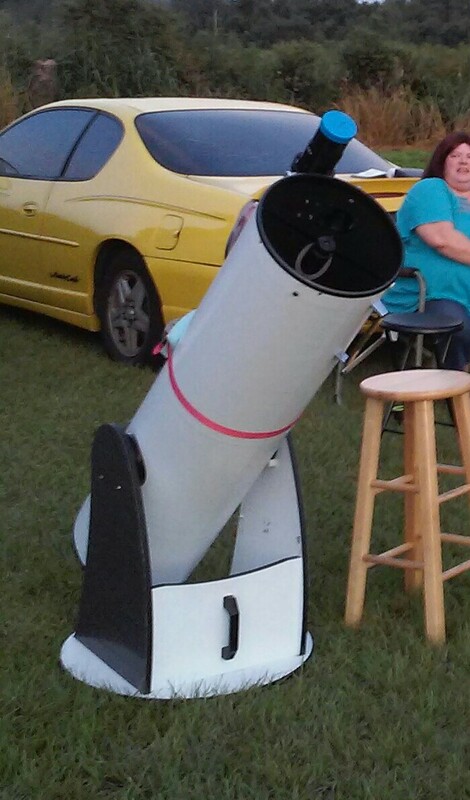 Also, it turned out that the MOSI Mars Clubs was in attendance on site with their own observing activities. I even share a brief moment with one of the budding amateurs when we spotted a satellite traversing the sky from south to north through the constellation Cepheus. It was great to see budding amateurs showing a great interest in this awesome past time. Above is a photo of Mark and Tish along with his newly acquired Celestron 8" f/10 Schmidt-Cassegrain. In the background you can see the Mars Club having their instructional session. In the foreground, the Jaegers 6" f/10 "Gelinda J. Dawson" refractor pokes its business end into the shot. Now, let's focus on the night's observing session. My first object of the evening was Arcturus, to do a star test. The star was looming low in the western sky as dusk settled in. What a beautiful site! Peering off toward the south a bit, there was Saturn. It was about 15º to 20º degrees above the dusk lit horizon. I took aim with the "GJD", and captured it in the field of view in the new Lunt 20mm 100º eyepiece. Though small, the view of Saturn was quite pleasing at 76x. Titan was seen to the north-northeast of Saturn, and Rhea to the east-northeast as dusk sat in. I then boosted the power to 169x using the Explore Scientific 100º FOV ocular. Chromatic aberration was present, which was brought on by the fact that Saturn was so close to the horizon, the view was still acceptable. But, I had to also account for the fact that the scope had not fully acclimated. As time went by it did, and the views got progressively better through the night. Here Mel Dawson poses next to his Jaegers 6" f/10 "Gelinda J. Dawson" refractor sitting atop a Losmandy G-11 EQ. He constructed the instrument back in 2013. This is its debut trip to FOO. The scope performed quite well, but more work needs to be done. As dusk gradually faded to darkness, I moved to observing some of our favorite DSO's. Actually, my main objective for the night was to see how well the "GJD" would perform on these beautiful cosmic wonders; notably globular clusters. My first DSO object was M13 (the Great Hercules Cluster) in Hercules. Using the Lunt 20mm, I quickly aimed and captured the cluster in the field of view. The eyepiece did fine in resolving a good collection of stars around the perimeter of the cluster, but I wanted to get up close and personal and see if I could resolve more stars with the Explore Scientific 9mm. It definitely did the trick, but I was not completely satisfied. So, I figured I would let the scope acclimate a bit more, and in the meantime I would venture over to see how things were going with Mark. Mark was checking out Saturn at the time and wanted me to rate few of his oculars he had recently acquired. 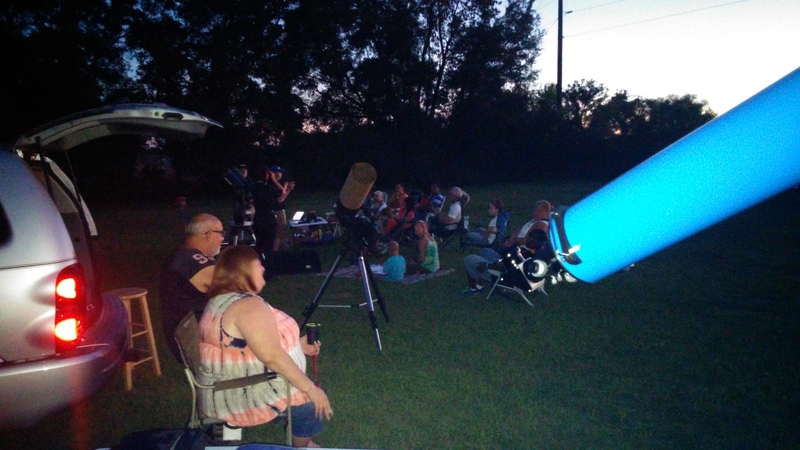 He had a Meade Xtreme 14mm 100º 2" format eyepiece on his 8" f/10 and it was performing splendidly! Despite Saturn's position on the opposite side of the solar system from us, the Cassini division looked quite impressive! It was very evident that his Celestron had some great optics. After another 15 minutes of acclimation, I went back to the "GJD" to see if there was any difference in the quality of the image. I was pleasantly greeted with an improved view. I contribute this due to the darkening of the sky, which aided in increasing the contrast between the sky and the ringed planet. As I continued to looked through the 6" f/10, I was beginning to wonder if the crown element was flipped in the wrong orientation. This thought came to mind because of how the stars appeared when I racked them in and out of focus. I noticed a ghostly glow around brighter stars when I the focuser was racked inside of focus. This is something indicative of a flipped crown element. I will test this theory out soon. But, despite the anomaly, the Gelinda J. Dawson refractor performed quite well on the DSO's I viewed the rest of the night. Speaking of DSO's, both Mark and I decided to take a look at M22 in Sagittarius. Mark called me over to look at the globular with another one of the eyepieces he wanted my to check out; the Meade 40mm Series 5000 possessing a 68º FOV. This is a great eyepiece in that the stars appeared super tiny, which is indicative of fine optical quality. It did so on both his Celestron 8" f/10 SCT, and in my Jaegers 6" f/10 "GJD" refractor when I used it to look at Albireo (β Cygni); a Tish Jennings favoraite. It was reminiscent of the pinpoint stars produced by my TeleVue 24mm Panoptic eyepiece. We continue to look at M22 in the "GJD" and kicked up the magnification to 169x using the Explore Scientific 9mm. The view was very good, with stars resolved to the heart of the cluster. Not bad, but I still felt that this instrument could do better. So, rather focus on the negative, I accentuated on the positives and began sweeping the star encrusted regions in Cassiopeia and Cygnus. One thing I was very impressed with, was the excellent contrast the telescope was providing. Star fields stood out prominently against a jet-black background. I was also pleased with the rendering of star colors produced by this instrument, as well. I contribute this to the ProtoStar flocking material I used throughout the OTA. As Mark and I scanned across the sky hitting DSO's, we decided to hit M57 (The Ring Nebula). First we peered through Mark's 8". He had already kick the power up to 145x using his Meade 14mm mentioned earlier. The Ring Nebula appeared huge, as compared to what magnification I was use to looking at the nebula under. I should have known I could have kicked up the magnification on this object, as I normally do on globular star clusters. I was able to faintly make out the central star in the 8", though it was difficult. But, what surprised me was the visible structure of the nebulosity within the planetary nebula. I could see variations throughout the ghostly ring. So, I then went over to my scope and first picked up the Ring Nebula with the 20mm Lunt. I quickly switched over to the 9mm and was happy to see that the Jaegers was performing well. Though I could not see the central star at 169x power, the nebulous ring showed structure; thanks to the great contrast attributes that this instrument possesses. It was around 21:30 when I noticed that M31 had risen above the trees towards the east-northeastern section of the sky about 50º degrees above the horizon. With the Lunt 20mm back in tow on the "GJD", I pointed to a glow that I suspected was the Andromeda galaxy. After pointing in the general direction of M31; a direct hit! Even at 76x power, the galaxy filled a significant portion of the 100º field! Again, contrast was the prominent factor in seeing this object so well. The night continued with looks at other great objects such as M11. We even did a shootout between the Zhumell 9mm 100º eyepiece and my Explore Scientific 9mm 100º. The difference was ever-present in that the ES ocular resolved the hearts of the globular clusters we viewed like a champ. But, for the money, the Zhumell was well worth the $120.00 retail price. We concluded the night sharing stories and talking under the stars until around 23:00. I even shared Gary and my trip to Stellafane 2014. I must say that this was a great observing session even though we did not see as many objects as we had liked. I was hoping to checkout the Double Cluster in Perseus, but would have had to wait a bit longer for it the rise above the trees. Unfortunately, every one started packing up and moving out around 23:45. Before leaving, Mark and I discussed what we were going to bring for the next observing session on November 14, 2015. He is planning to bring his 12" f/5 Dobsonian (see photo above), which possesses a Royce primary, and I my Meade LX200-R (a.k.a. ACF) 10" f/10 SCT. Gary will be down on vacation from Slidell, LA and I look forward to him meeting Mark. Until then, I hope you have enjoyed reading this report as much as I have writing it. 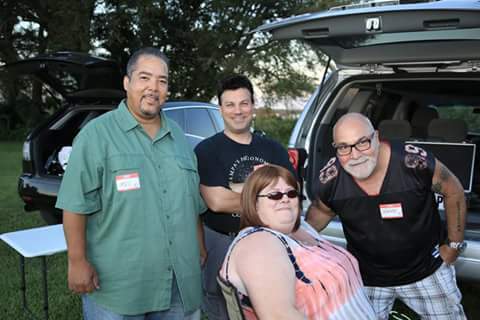 Here is a photo of me, Brian Buttafuoco, with Tish and Mark Jennings all set to observe out at FOO.